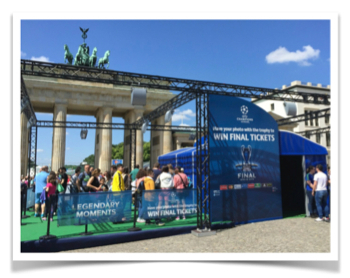 Image Insight were called upon to provide a total solution for UEFA for the Champions League Final, in Berlin, in June 2015. This was the final match in Europe’s premier club football tournament, held near the Brandenberg Gate in Germany. We were chosen as UEFA needed a system which could handle large quantities of visitors quickly, efficiently and reliably, whilst still providing a great guest experience. At UEFA, we photographed approximately 20,000 people in 2.5 days! That's 1 photo every 15 seconds! Photo fulfilment took place online via a specially built UEFA micro-site, which we designed in accordance with their brand guidelines. Within seconds of having a photo taken, a guest was issued with a printed receipt. This included the secure, digital, photo number, enabling guests to obtain a digital soft copy of their photos (from the micro-site) and share them almost instantly to social media, email them to friends and/or download them to their device. In order to maximise the data opportunities, we built an online form into the system which guests had to complete before downloading their photos. Built into this system was the chance for guests to win Cup Final tickets and the option to receive ongoing newsletters. In this way, data capture can be extremely useful for our clients for long-term customer relations and marketing purposes. If you’d like to know more about our work with UEFA, you can also read about our Photo Solution on the Trophy Tour Train for Euro 2016. If you’d like to know more about how we could help you, please contact us.